An ambitious blend of film noir archetypes and music, Gunmetal Blues is likely to polarize audiences with a strong feeling for either of its main sources. For some, the mixture will go down as smoothly as a classic cocktail. 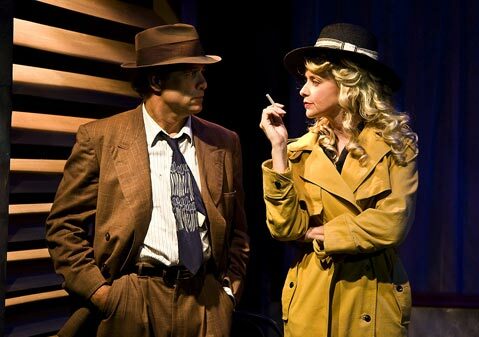 Others are likely to prefer their film noir or musicals “neat.” Gunmetal Blues is a lot of things-beautifully staged and sung, powerfully acted, full of carefully crafted one-liners and plot twists-but neat is not one of them. Given the unenviable job of keeping three similarly blonde characters separate in the viewer’s mind, all while singing and dancing in heels, Rogers remains strong and confident. Her turns as Princess, the displaced homeless woman who provides Galahad with crucial clues, are thoughtful and dignified, while her loopy lounge singer numbers have a giddy energy that threatens to crash at any moment. As the pianist, but also as a cop, a cabbie, and a mobster and his goon, Massey displays a remarkable gift for sudden changes and a subtle comic timing. Finally, as Sam Galahad, Halsted acts as though he stepped out of a classic film noir and onto the theater stage. It’s a nuanced performance that manages to hit all the jokes without trying to be funny. When Sam sees stars, or makes eyes at a dame, a whole celluloid world flashes through him.